Yalghar is a must watch movie, The Film has good score in all departments such as Direction, Cinematography, dialogues & background score. In Acting department Bilal & co stars performed very well, Rana fits well in his role, Shaan looks amazing as ever & so is Adnan & Khosa.However Sana Bucha was a disappointment, Other female co-stars were average. Since Humayon Saeed is a romantic hero, his appearance as a Negative character was not much appealing, at least for me. The dialogues for Humayon (Torjan) were also not great. Gohar's performance as a confused negative role was the best. 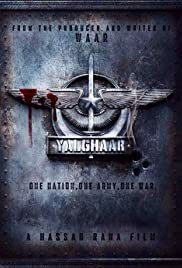 But overall the Movie is amazing, this movie is better than its first version i.e.WAAR & at the end full marks to the Direction & Production.